Winzeler Stamping | Screw Machining – Custom Metal Stamping | Winzeler Stamping Co.
Automatic screw machines were originally used for the specific purpose of producing screws; however, today they are used to make a multitude of precision metal components. 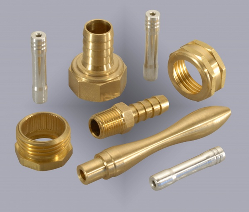 Having screw machining capability at Winzeler Stamping Company has proven to be a cost effective solution for producing high strength, high volume turned parts for our customers, as well as an important piece of the fabrication process in our own products such as garden hose couplings. 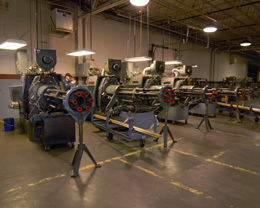 Our screw machining department features six-spindle 1 ¼” Acme Gridley screw machines that are able to work with square, hex, or round material in steel, copper, brass, aluminum, or plastic resins. The material fits between the end of each spindle and an adjacent plate or support. On a multi-spindle automatic screw machine, several different objects can be produced at the same time, with one object on each spindle. Or, the multi-spindle machine can be used to make a single product more rapidly. As the spindle turns, it rapidly rotates the metal object. By applying various tools to the metal, the machines can cut, form, or shape the metal into the desired product. 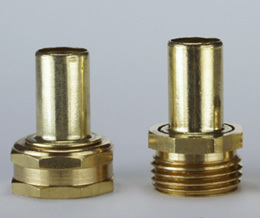 Additional operations such as burnishing, knurling, thread rolling, tapping, drilling, reaming, cross-drilling, and broaching can be accomplished via screw machining. The production of metal components using screw machining technology results in high precision parts with close tolerances. 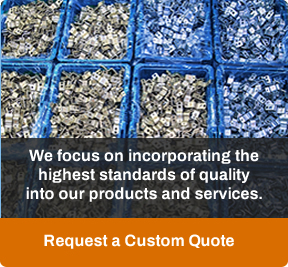 All of our parts are carefully inspected by our team of Quality professionals. We also have the capability of performing a number of secondary operations such as heat treating and plating to provide you with a finished part for your application. The combination of skilled machinists, knowledgeable engineers and decades of metal working experience make Winzeler Stamping Company the perfect choice for all your metal stamping or machining needs. Whatever tolerances, standards, or specifications you desire; we will meet your requirements. We are certified to ISO 9001:2015 quality standards as an automotive supplier. We serve a number of diversified industries and we welcome the opportunity to for quote you. Send us a drawing or use our online quote form.